Always a popular meet, 18 were signed up for this weekend at the Pottery Bunkhouse, near Laggan. Saturday was a day from heaven. Probably one of the most beautiful winter days ever. Bright blue, cloudless skies, and not a breath of wind made the conditions overhead perfect. Underfoot the hills were absolutely plastered with snow, so climbing anything at all was going to be hard work. Because of the lack of any breeze whatsoever, the mountains were reflected perfectly in the lochs, creating a truly spectacular winter scene. 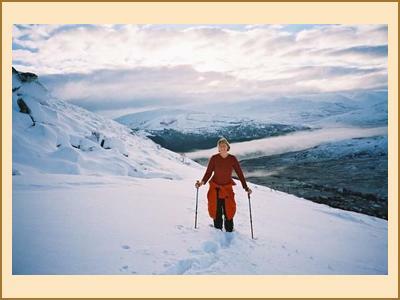 Several went off cross-country skiing near Garva Bridge, with others heading for the downhill slopes of Aonach Mor. Alison W, Fraser, Victoria, Sandra and Humphrey opted for the 3 Munros above Lochan Earba but ended up only doing two due to the very deep snow. Alan and Anne climbed Carn Liath and Stob Poite Coire Ardair from the Creag Meagaidh car park; Richard went off Grahaming just for a change, and Owen and I climbed Binnein Shuas. This we did somewhat by accident. Having seen the amount of snow we had (separately) come to the conclusion that climbing anything without a broken trail was going to be very hard. However, some incredibly kind person to whom I owe a very large drink had indeed broken a trail which Owen and I decided to follow. Even with the trail, higher up, the snow was really deep - all that could be seen of Jessie (the dog - Webmaster) at one point was the hair along her back and the tips of her ears. From the summit, however, all the tromping was rewarded by some of the most spectacular views I have ever seen. To make things even more beautiful, when the sun started to set the sky turned the most glorious shade of crimson and gold - in fact, it looked as if someone had started an enormous fire behind the distant peaks. A wonderful day. Quite a few took advantage of the Pottery's outdoor hot tub and cooked away nicely in the bubbling water, apparently oblivious to the near-freezing temperatures. Sadly, Sunday was a completely different story. 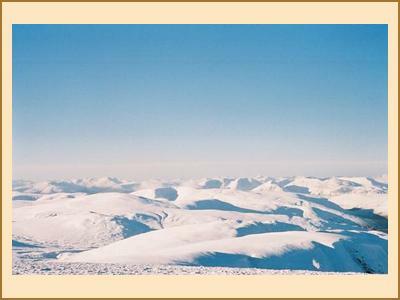 As far as I know, one or two struggled up the likes of Geal-charn at Drumochter in foul conditions. I'm also pretty sure Fraser and his gang were off Munroing. A few opted to head home and another gang headed for Loch Ordie near Dunkeld with Kenny and Alison climbing Beinn Duchray (spelling? ).